Natalie Hunsaker and Our Homeschool Project: 32 Weeks and Counting! I added the column for "emotionally safe" because this is when the risks of major, long-term complications of all these risks go WAY down. The babies may still get them, but not as badly as the micro preemies (under 28 weeks). 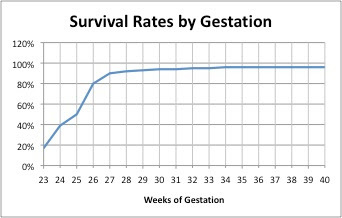 The column for "statistically safe" means the risk has altogether disappeared as a result of prematurity alone. --BPD: even though the problem doesn't completely disappear until 34, 32 weekers rarely need the ventilator. If they do, it's usually only for a couple days (Brynn was on it for 2 months). Yes, they may need C-PAP or a cannula, but the lungs will be fine overall. --IVH: The NICU stops doing routine MRIs (checking for head bleeds) after 32 weeks because they are so rare. --NEC: only occurs past 32 weeks if baby has been deprived of oxygen due to pregnancy or delivery problems. --PDA: although it can occur even in a full-term infant, it's not going to cause major problems or require surgery as a result of prematurity if the babies are over 32 weeks. And even though it's not on the table above, the NICU stops routine eye exams at 32 weeks as well. So ROP isn't a problem, either. Can you see why I'm so ecstatic? 1) I was taken off Procardia a few days ago because my blood pressure got dangerously low and I was getting pretty sick. 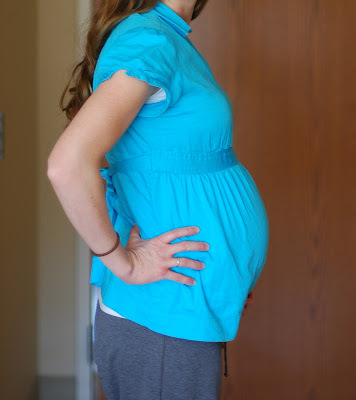 Everyone was nervous I'd have the baby because even while on the Procardia, I was having stronger and more frequent contractions with each passing day. But, oddly enough, all the contractions stopped as soon as I was off the Procardia. I only have a few here and there and they are much lighter. 2) Doctors and nurses are starting to think I could actually make it full term now--especially since contractions slowed so much after being off Procardia. Maybe not, but once I get to somewhere between 32-34 weeks, the pelvis plus the size of the baby's head do more to hold the baby in than the cervix does. Wouldn't that be weird if I got that far??? If Heidi didn't need a NICU stay at all??? It really seems quite unfathomable to me, but I guess you never can tell . . .
Wow...those are great statistics. It makes me really glad I made it to 27 weeks (although we did deal with PDA and IVH, and a little BPD). I can't believe that there is hope for you going full term! That's AMAZING! This is huge, Natalie. No micro preemie...no preemie...no NICU! NO SURGERY! This makes me beyond happy. Congratulations! I was one of those who was "celebrating" (with grumbles) week 41 of pregnancy; I had no idea when these sorts of milestones passed. I am so happy for you and Heidi, and I hope that she keeps baking! Whoo!! I think about you every Friday that goes by and this morning I was happy to hear that you got this far!! I did a little happy dance for ya! I would really love to come see you before you have your little girl! I'm celebrating for you too! I have a heart shaped uterus, and didn't know it until I was pregnant with Sterling...the risk of going early are always present, and most women who have this can't even conceive, but if they do usually miscarry early in the pregnancy. For some reason God blessed me with three beautiful babies, that were early, but "full term." I didn't even know all the info when I was having kids! So awesome to be aware of your body, baby, and family. We are so fortunate that God has blessed us with his children and made loving and wonderful families for us! Stay Pregnant little woman, God has the best plan. As a woman said at my church group, "God always has the best timing, but has missed several great opportunities on the way." In this case, missing those opportunities has kept your little one safe and growing. See, he does know best! It's true - the belly is bigger in real life. So excited and definitely celebrating for you today. Your faith is amazing (I say that because I'm convinced that it has helped in this process)! Love you! We've been thinking about you all week, praying you'd make it until today, and now you have! Your belly looks great, I just wish you had included your head. Heidi would enjoy seeing your face in the picture too, even if you aren't wearing makeup. I am excited for when you'll make it out to Utah and Jason can have another friend to play with. You look adorable Natalie and I am so happy you made it to 32 weeks! Congratulations!! !